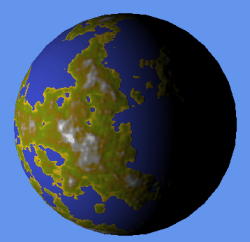 A hybrid approach for procedural planets. The holy grail for rendering planets is a single shader that generates all the terrain, lights it, textures it, and displays it. Sadly we are not there yet. At the moment we do not have read/write textures in the GPU, so we have to fetch the generated data back into ram for additional processing. We can do a lot of the processing in the GPU though, which is why this is described as a hybrid technique. Traditional techniques for generating terrain use fractal systems, a common and very effective system is mid-point displacement. The disadvantage of this type of technique is that it requires access to the entire array when generating data. This makes it impractical to implement as a shader. So we are going to use a noise function to generate our terrain, which can be implemented as a shader. This is intended for people who are competent XNA coders, I will gloss over many things which I consider to be standard code. I will however supply full source code so you can cut and paste to your heart's content. The end result will be a set of classes that can be easily re-used in your own code. However these routines are very much experimental, I would not call them production quality. They will however be an excellent starting point for your own code. Before we can start building planets, we need to know some information about them. I hold this data in a base class which we will build on as we go along. At the moment we don't need a lot of data, just a type and seed. I am going to be considering five planet types which should cover most of planets in our universe. I also need two textures the perm texture and the generated terrain, or mercator. As yet we don't have a random number generator in the GPU, so we have to cheat. We generate a random array of numbers, based on the planets seed, and store this in a texture that we pass into our shader. It's very simple to do. This will produce a texture something like this. The heart of our system is a noise generator. 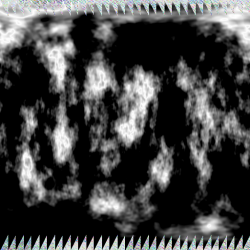 The noise function is implemented in the shader. 3D mesh of a sphere at the shader and it will give us a mercator map. Perfect. //=  3D simplex noise. Comparable in speed to classic noise, better looking. // For the 3D case, the simplex shape is a slightly irregular tetrahedron. // determine the magnitude ordering of x, y and z components of Pf0. In the pixel shader I call the noise function to generate a height value, then scale it. planet and is included for later use. First thing to do is create a class WaterPlanet that has Planet as it's base class. Now we need to add a RenderTargetState to the base class and write the Generate function. So we add this code to the base class. The end result of all that code is something like this. Interesting, but not very planet like. So now we need to display it. Y=0 is at the top (water) and Y=1 is at the bottom (ice). mercator and color map and displays it. We might as well add some lighting at this point. The final stage for this part of the tutorial is to draw the planet. The effect is loaded in the WaterPlanet classes LoadContent method.